Happy birthday Robin Brancato (Winning). It’s the birth date of James Otis Kaler (1848-1912), Toby Tyler: or, Ten Weeks at the Circus, and Lucy Bate (1939–1993), Little Rabbit’s Loose Tooth. In 1915, Pluto, considered a planet until recently, is photographed for the first time. The United States Congress establishes time zones and approves of daylight savings in 1918. Read Daylight Runner by Oisín McGann and Saving Shiloh by Phyllis Reynolds Naylor. It’s National Quilting Day. Read The Keeping Quilt by Patricia Polacco, The Quilt by Gary Paulsen, and The Quilt by Ann Jonas. For our celebration of mysteries that began last week, let’s look at one of our best-written mysteries for young readers, Philip Pullman’s The Ruby in the Smoke, first published in the United States in 1987. With this book, Pullman, a former schoolteacher raised in Rhodesia, Australia, London, and Wales, launched his career as a writer for children and young adults. A few years after the Sally Lockhart mysteries appeared, Pullman became internationally famous for the His Dark Materials series, which began with The Golden Compass and was later adapted into a movie. 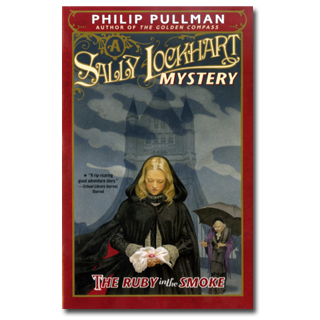 Sometimes we continue to love best the first book we read by an author, and The Ruby in the Smoke remains my favorite title by Pullman. In it he explores neither religion or theology or any other serious matter; he simply uses his many gifts to tell a good tale. Perfect for Sherlock Holmes Weekend, the book is set in Victorian London, with its dark alleys, poverty, and underworld crime. Sally Lockhart, who believes she has just become an orphan at sixteen, shows up at her late-father’s offices and asks about a mysterious note sent to her with the words “The Seven Blessings.” When she mentions the phrase, an office worker, Mr. Higgs, dies on the spot. So Sally’s quest begins – to find Major Marshbanks, also mentioned in the note, and ultimately to go on a quest for a valuable ruby. The story explores opium dens, Britain’s trade in the Far East, the development of photography, and life in London for those with few resources. So completely does Pullman evoke the world of Sherlock Holmes, that readers almost expect him to make a cameo appearance. But Sally, as the heroine of the tale, doesn’t need him to emerge. With ingenuity, bravery, and some help from people who become her friends along the way, she locates the ruby and unravels other crimes of the past. And, best yet, she receives enough money in the end to set herself up in business—and for future stories as well, including The Shadow in the North, The Tiger in the Well, and The Tin Princess. Ideal for ten- to fourteen-year-olds, as well as adults, the book demonstrates Pullman’s strengths as a writer. Even in this, his first book, he masterfully weaves a complex and interesting plot that envelops the reader with mystery and suspense. I’ve always thought that Sir Arthur Conan Doyle himself would love to read The Ruby in the Smoke. Beyond the Tower of London, between St. Katherine’s Docks and Shadwell New Basin, lies the area known as Wapping, a district of docks and warehouses, of crumbling tenements and rat-haunted alleys, of narrow streets where the only doors are at second-floor level, surmounted by crude projecting beams and ropes and pulleys. The blind brick walls at pavement level and the brutal-looking apparatus above give the place the air of some hideous dungeon from a nightmare, while the light, filtered and dulled by grime in the air, seems to come from a long way off—as if through a high window set with bars. Originally posted March 19, 2011. Updated for . I remember this book from when I was younger and I recall having a hard time putting it down. Just like all of Pullman’s work, I’m always so eager to see everything come together. Thank you for featuring this splendid series. While my heart does belong firstly to His Dark Materials, I adore this series too. Sally is a wonder and I do hope he someday finds the time to give her another adventure (or perhaps he’ll move on to next generation?) Have you seen the television version? Wasn’t half bad, I thought. I’ve not read this Pullman book, but I have read all the His Dark Materials books (Book one being Golden Compass. A/K/A Northern Lights in the U.K.) and I’m a serious devotee of Pullman. He’s brilliant and courageous. A friend of mine called His Dark Materials Harry Potter for grown-ups. I just discovered this book and its sequels this summer. I tore through them all and loved them! They started a mini-obsession with Victorian era historical fiction. I think what I love most about them is the fact that you can’t tell when they were written. There’s not an 80s or 90s feel to the books. They’re timeless classics. I, personally, like them more than His Dark Materials so I’m glad to see them getting press. I saw Mr. Pullman speak at a Children’s Lit conference in Oxford a few years ago. He’s fabulous. Thanks, you’ve sold me! I’ve been kind of off-on with Pullman’s fiction (and anything he says that ISN’T fiction I just tend to disagree with entirely), so I didn’t know whether I should bother with these. Obviously, I should! The Lockhart books work for anyone who likes a good mystery. Have a wonderful time with them. Thanks everyone for your comments; you always make it possible for me to have a wonderful time with the Almanac. Pullman’s His Dark Materials series are some of my favorite fantasy/adventure books of all time. But if I’m looking for a good mystery, I turn to his Sally Lockhart series. The historical elements are as important to these books as the magic/fantasy is to Lyra’s story. I am a huge fan of Pullman’s Dark Materials books! I think he’s one of the best authors writing today. So I blush to say I haven’t read Ruby in the Smoke, but I shall remedy that ASAP. Thanks Anita for spotlighting the best! I just read the first three chapters of The Ruby in the Smoke today, and I do indeed have something new I want to read. Yes, I like it. Having read all of the Holmes work, I believe the old boy would have liked this Pullman book. I already see a few little similar theme bits which will appear in the later Golden Compass, a book Doyle would have rejected outright I think. Understandable given his overwhelming emotional loses, and the times. I am thrilled to see The Ruby in the Smoke make the almanac! The Sally Lockhart books are fantastic and I absolutely love Pullman’s writing style. I was completely taken into Sally’s world and they renewed my interest in historical fiction, though I have yet to read any I enjoy as much as the books in this series. I remember reading Ruby in the Smoke and loving it when I was younger. A few years ago, when I sat down to read The Golden Compass, I went in thinking that I hadn’t read anything by Philip Pullman. And then I got to the end and was reading the note about the author and discovered that I was wrong. I love how different the Sally Lockhart books are from His Dark Materials. I think it shows an amazing amount of talent that he is able to write such wide ranging fiction. I agree this is a fabulous book. Such a tight plot and the opening scene was so powerful. Did you know this was made into a televsion series? Very well done from England. It is so exciting when I see books I have read on your blog Anita. Thanks again … your work is so inspiring. I absolutely ADORE this book. I may be one of the few who like it better than His Dark Materials. The whole series is fantastic. I love Sally Lockheart–what a spunky, wild girl. And definitely a great Arthur Conan Doyle vibe! That’s the perfect comparison! It’s also worth mentioning that Masterpiece Mystery did a fantastic adaptation of the book with Billie Piper and Julie Walters. That was actually my first introduction to it, and the film version is surprisingly good!